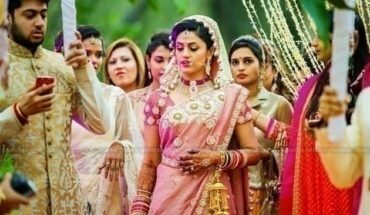 Wedding Reception is the event where South Indian brides come up with a lot of variations and not just stick to the traditional or old looks. Various designers these days have created a wide range of wedding collections exclusive to the taste and preferences of South Indian brides. In case you want to have a strong and unique statement for your wedding reception look check the following options and plan your wedding dress as you wish to. Many of us, at least for once, have converted their mom’s old Banarsi sari into a salwar suit. Some designers have taken it to another notch by designing long skirts made of the Banarsi silk fabric. Now you can do something on the similar line by converting a Kanchipuram silk saree into a lehenga choli for your South Indian Wedding reception dress and give yourself a North Indian twist. Watch the below video, to know about how to choose the color for Kanchipuram silk saree. Being the reception day, you get the privilege to try out interesting combinations and make an out of the box statement for yourself. Check the beautiful kanjivaram lehenga by famous designer Neeta Lulla below. There are some brides who prefer to wear the dresses from the old heirloom wardrobe of their family. Such a dress is an old treasure carrying a lot of importance. It carries oodles of emotions. So if you are one such bride, who wants to go for her mom’s or grandma’s wedding saree, then nothing can be better than that! While carrying the rich old heritage, you can also give it a modern twist. Get a jacket blouse or add an extra thin border of glittery embellishments. You can also play with the draping techniques and get a modern bold look with the old heirloom saree. Whatever you wish to do, do not forget to dry clean and polish the saree. 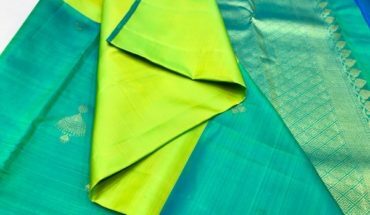 This will add a clean and fresh look to your moms’ or grandma’s age old saree. Couples prefer to get matching and contrasting combination dresses for themselves. But at times, they face difficulties in getting the right matching combination. There are simple ways to mix and match the bride-groom dresses. One, you pick a colour combination and get the dresses made such that either of the bride’s dupatta or lehenga, saree or the blouse matches with the groom’s sherwani or any of the dress elements. Or, you can go for the contrasting colour way, where the bride’s and groom’s dresses are made in contrasting colours. Also, you can fix a particular design pattern as per the fabric and get it embossed on both the bride’s and groom’s dresses. This way both the lehenga or saree and the sherwani will have the same motif on the body. You can keep the colour coordination on the similar line while doing this. The latest bridal blouses that are running in the market come up with a wide variety of embellishments patterns on them. Some have beads or pearls while some have colourful zircon stones stitched intricately. You can choose from those varied combinations and have a customised bridal blouse exclusively for yourself. Eventually, with your stunning bridal blouse, your wedding reception look will be quite a head turner. Check the below given interesting blouse patterns that are going rounds. With the biggest hit of the year, Indian mega movie Baahubali 2; have also inspired many of the to-be brides. How? Well, the extraordinarily gorgeous looks that actress Anushka Shetty carried while portraying the role of warrior princess Devasena are creating a buzz all around. More and more people are searching for makeup tutorials for the Devasena looks. These looks are very traditional South Indian and can be re-created easily as the bridal looks of today’s South Indian brides. Liked any of the ideas? Want anything out of the box? TBG designers at your service ma’am! Just take the first step towards us via any of the virtual contacts we have. Our expert team will revert with all the required suggestions that will be just picture perfect for you in every way.